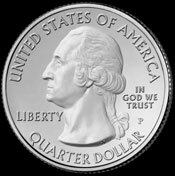 The United States Mint has released the full register of sites that will be featured on the upcoming America the Beautiful Quarters Program. This program will feature rotating reverse designs which feature the National Parks and National Sites in the 50 States, District of Columbia, and United States Territories. A total of 56 different designs will be released over the course of 12 years, beginning in 2010. These new quarters will honor some of our most revered, treasured and beautiful national sites – majestic and historic places located throughout the United States and its territories that truly make us “America the Beautiful.” The designs will help reinvigorate interest in our national parks, forests, fish and wildlife refuges, and other national sites, as well as educate the public about their importance to us and our history. The first five sites to be featured on the 2010 Quarters include Hot Springs National Park in Arkansas, Yellowstone National Park in Wyoming, Yosemite National Park in California, Grand Canyon National Park in Arizona, and Mount Hood National Forest in Oregon. The obverse design for the entire series will feature a portrait of George Washington. This will be the original version used on the 1932 Washington Quarter. There had briefly been speculation that Washington’s portrait might be removed in favor of Theodore Roosevelt. The release schedule for the duration of the program is included below. The sites will be featured in the order first recognized as national sites.